Automatan, LLC of Plover, Wisconsin and Systec Conveyor Corporation of Indianapolis, Indiana announced today the merger of their business operations under the new name, Inspire Automation. 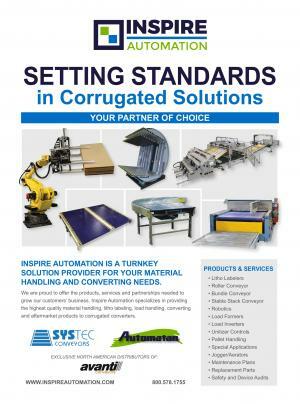 Automatan and Systec products incorporate over 65 years of combined engineering expertise, and together they can offer unified material handling equipment solutions to the corrugated industry. Private equity group Hamilton Robinson Capital Partners purchased the two companies in 2016 with the strategic goal to merge Automatan and Systec into a single entity now formally named Inspire Automation. Inspire Automation’s expanded business capabilities will serve corrugators across North America and the globe. As part of the merger, Inspire Automatan has also launched its new website inspireautomation.com where you can learn about new products and purchase parts for your Automatan and Systec products.